Aromatherapy and its uses have been popular for decades but its use seems to be getting more and more popular every year. Each year we discover what more beneficial things aromatherapy things can be done that are beneficial for humans in a therapeutic way, to address imbalances in our bodies and to help poor health. 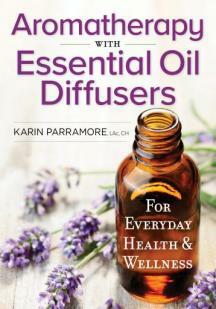 One of the ways to do this is with a diffuser, says expert aromatherapist Karrin Parramore, who wrote this very book. She teaches you how to use essential oils, armos anni to ylang ylang, so that you may improve your physical, mental and emotional health and to destress your time, your workplace and even your car! Part 1 of Aromatherapy With Essential Oils: For Everyday Health & Wellness covers the history of aromatherapy, while explaining the different types of diffusers and teaches you how to choose, use and store essential oils. Part 2 provides detailed instructions on diffusing essential oils to treat various health conditions and offers over 100 formulas for specialized oil blends. This book is about aromatherapy. Specifically, it's about how to diffuse essential oils for improved health and wellbeing. The term aromatherapy is used a lot these days and as essential oils become more popular and more trendier, what exactly does this word mean? At its most basic level aromatherapy means the use of aroma in a therapeutic way. To address the imbalances of our bodies that can lead to poor health. Humans have been using plant materials for millenia. From everything from food to shelter. And from cleaning to medicine. In these modern times of concrete homes and packaged foods, it is easy to forget how dependent we are on plants. If plants were to suddenly disappear from our lives we would not only starve and not survive, we wouldn't last more than a few weeks. Scent was so important to the ancient Egyptians that they even had a goddess of fragrance and her name was Nefertem? Fragrance is so functional to our lives, it serves to help us decide what is safe to eat (avoiding spoiled vs. safe food). People have been trying for thousands of years to be creative in adding fragrance to themselves and their environment. Especially when it comes to avoiding synthetic fragrances. Using natural vs. synthetic fragrances is better makes for a better and greater balance and healthier life. For example, hops were used as a strewing herb, oddly perhaps, as they tend to be sedative, but these were first limited to pubs and drinking houses where they were first used to brew ales. Candle heated diffusers may be particularly helpful in the bedroom, when using a blend to increase libido as the soft glow of the candle can enhance the effects of the oils. A cooling drop of peppermint oil in the summer or bright grapefruit oil in the winter is a nice way to clear the air. Essential oils can be used many ways but one way is to inhale them orally, apply them to the skin (never directly), ingest them, or use internally via suppository, douche or enema. Diffusers can be used ot resolve issues in your home, work space or car, such as mold in your bathroom or mice in the attic. Here is a relaxing into sleep blend I find very helpful for my insomnia. It helps to set the mood at night, calming the mind and the body, allowing for it to get ready to sleep. Use in a nebulizer, diffuser, humidifier, full body bath, spritzer or on a cotton ball. The idea is to get the blend in and around your senses so that it actually reaches your olfactory nerve and sends the signal to your brain that it is time to sleep, especially if you have trouble sleeping. Like myself. Lavender and chamomile are very calming. Chamomile tea is also good at night before bed. As is not using any screen devices. There are so many wonderful recipe blends in here. For anything from menstrual woes to reducing mold. If you are looking for it, it's here. Karrin Parramore is an aromatherapist that teaches at the National University of Natural Medicine and Ashford University inf Bachelor's of Complementary and Alternative Health program. She obtained Chartered Herbalist status from Dominion Herbal College in 2001 and has a degree in Chinese Medicine from the Nation University of Natural Medicine. She has been practicing aromatherapy since 2002. Aromatherapy With Essential Oil Diffusers is available from www.robertrose.ca, www.barnesandnoble.com and www.amazon.com.